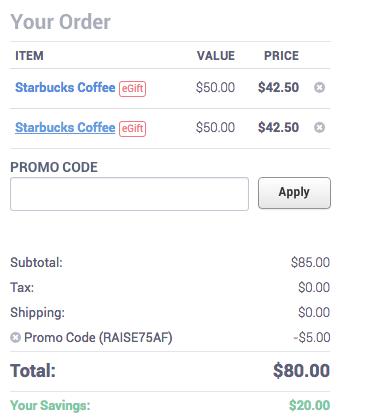 Raise.com is currently offering up to 17.5% off Starbucks eGift cards. The larger the denomination, the more you save. Use Promo Code RAISE75AF and save $5 if you spend $80 or more. Promo code expires at the end of June. 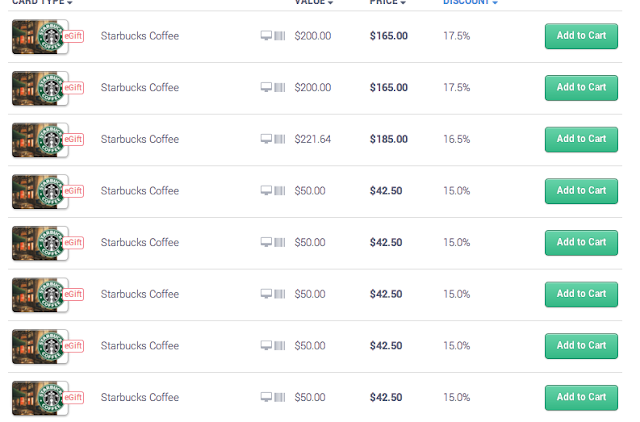 The best deal is to buy two $50 Starbucks cards for $42.50 each which is only a 15% discount, but the final price goes to $80 after the promo code for a final discount of 20%. These are eGift cards and can be added to your current Starbucks card on your phone or physical card. The eGift card should arrive the same day you buy it. Start your purchase from Top Cashback and get 2% back as well! A couple of tricks for Starbucks. You save 10 cents per cup if you bring in your own reusable cup. Starbucks rewards are based on how many purchases you have with your registered Starbucks card. If you both have smartphones you can use the same account, but you have to sign in to your account every time. After 25 purchases you have Gold status and you get a free drink for every 12 purchases. Thank you AH for your help on this one.